I have just recently learned that Rex Witte passed away on May 27th. Rex was one of a small handful of remaining inhabitants in Glad Valley. He and his late wife ran the general store there from 1956 until 1982. Rex also ran the fire department in Glad Valley for many years, a volunteer affair that often was lucky to get one person – most likely Rex – to drive the truck. If enough people showed up to drive the truck – meaning one person – a lot of folks thought that was enough people to put out a fire. In addition to these jobs, Rex also farmed in the area. The Rapid City’s obituary also said that Rex was the postmaster in Glad Valley “until the Feds shut him down in 1997.” I’m not sure what the Feds shut him down for – whether it was a major FBI sting operation, all the postal customers moving away, or that Rex preferred to be out on his tractor. But, when my sister and I pulled up ten years later and tried to flag him down, we had a hard time getting him to stop that tractor. Once stopped, though, he sat on the tractor and talked to us for two hours. When he finally climbed off, I was amazed that Rex at 74 towered over my diminutive 6’3” stature. And, he had such a powerful grip when he shook hands. I’m told that he stayed active until the end, and that he was out chopping wood when the fates intervened. My Dad, who grew up nearby, remembers stopping in Glad Valley with my mother shortly after they were married in the 1950’s. His stark memory of Rex, who stopped by the store during their visit to sit with his buddies, was someone who was talking a lot of nonsense to impress the “tourists.” Rex had never met my Dad before then, so didn’t know that Dad was a refugee of long standing from the area. When my sister, Eileen, and I met Rex in 2007, he did have a lot to say about things and people, both in the area and in general. I had to stop him a few times and ask, “Are you serious?” I wasn’t sure at first, but then you’d see the twinkle in Rex’s eye and think that he was pulling your leg. Then, a few minutes later, you weren’t sure again. To be honest, members of my family who grew up in the area were a lot like that from time to time, especially my Uncle Neal who Rex said used to stop by Glad Valley every once in awhile. Neal told many tall tales with a twinkle in his eye, but never would admit that the tallest tale was anything but the unmitigated truth. Truth be told, I’m sorry there won’t be another chance to talk with Rex. 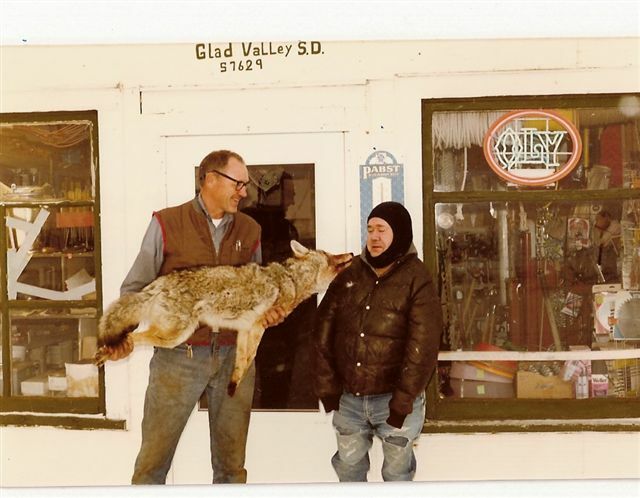 "Here is a picture of Rex and my friend Jack one day at Glad Valley when we came to sell a coyote to Rex. When you walked in the store where the till was in the center of the store there was a beam above the till with a pistol hanging on two nails. I asked Rex what was that pistol up there for? Rex said," When they come to rob me and say put your hands up, my hands are going up to that pistol – and Rex was tall enough to reach it! Rex always said," If I don't have it here – You Don't Need It!!!" One winter day I walked into the store, and above the potbelly wood stove hung a sign in plain sight as you walked in the door. The sign read, "Your Mother may love you, Your minister may forgive you, Your psychologist may analyze you – but if I find you shoplifting in here I'll break your God-Damned Neck!!!" "Once a year the Glad Valley Fire Department would have a dance and/or a pancake feed to raise funds for the fire department. People would come from all directions, some of these people you would only see once a year! Rex had a basketball hoop on the front of the store. Rex and the young boys would be out there shooting baskets with Rex playing defense! With Rex's huge wingspan it was no easy task shooting over him! When Rex would help at the pancake feed, he would mix the batter with a big electric drill and a paint mixer, telling people it really worked good for mixing up his coyote bait too!!!" 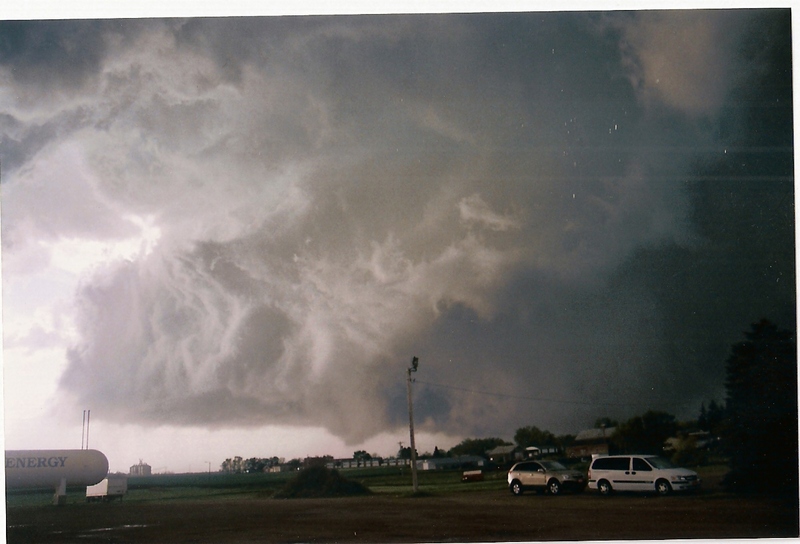 Stuart Surma of Java, South Dakota, was traveling traveling from Aberdeen to Java when he heard a tornado warning for Walworth County on the radio. He could see clouds darkening the sky in the southwest. Before he got to Bowdle, said Stuart, "a tail dipped down out of the 'wall cloud'!" 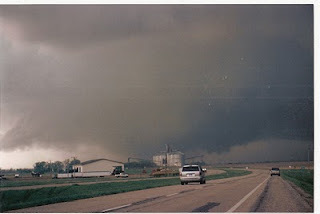 Once it touched down, it traveled for seven or eight miles from the southwest to the northeast gradually becoming a huge storm. "We drove up to about a mile east of it and then ran back to Bowdle to the "C" Store," Stuart told me by email. "It went whirling by Bowdle within a mile of the town!" 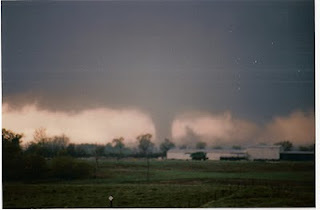 According to Stuart, a farm a mile north of Bowdle was "obliterated". Stuart also mentioned a couple of other farms that were affected, as well. He forwarded the three pictures, shown here, which he took through his windshield.